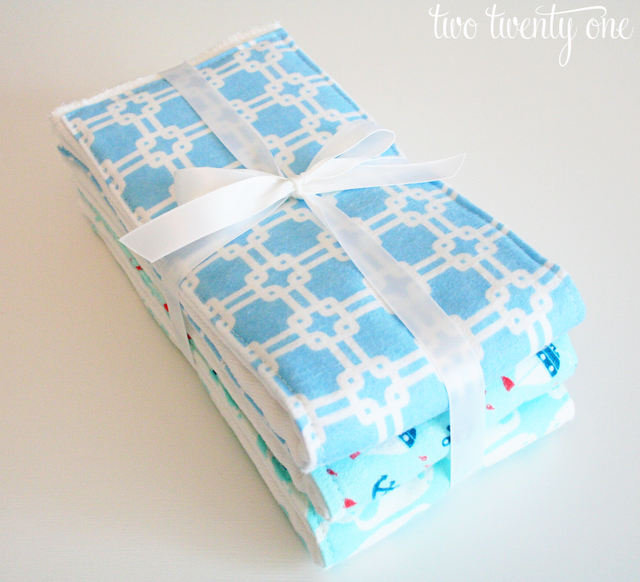 Everyone loves a handmade gift, especially when the gift is for a cute baby. So when my blog friend Kim from Newly Woodwards announced that she was preggers I knew I had to make her some DIY baby onesies and burp cloths. I made her baby boy two pug onesies– one onesie to represent each of her two pugs, Franco and Lola. 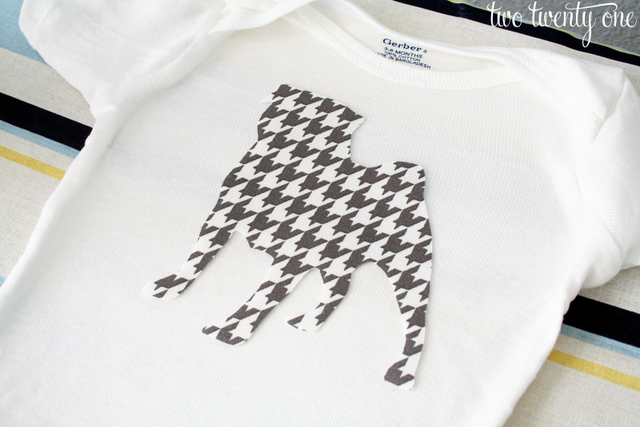 I chose the houndstooth fabric to go with the beautiful houndstooth quilt Kim made for her little man. I went with the striped fabric because I thought it was perfect for a little boy. Making the onesies was pretty easy. I found a silhouette of a pug through a google image search, printed it onto card stock, and cut it out. Then I grabbed some sewable interfacing. I ironed the interfacing onto the fabric I chose. 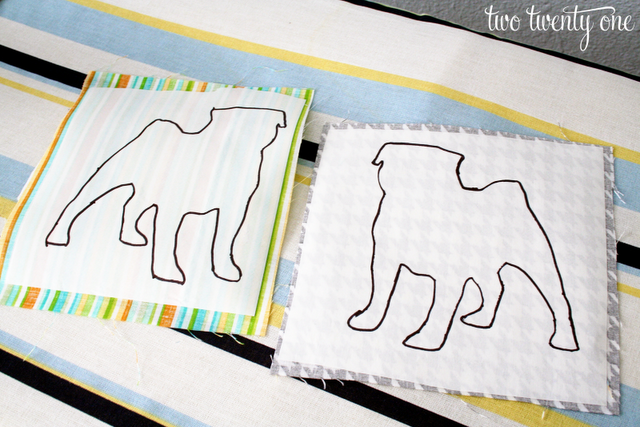 Then I traced the pug template onto the backside of the interfacing. Then I cut out the pugs and ironed them onto the onesies. And because I don’t trust my sewing machine (which still needs to be serviced), I had my mom zig-zag stitch around the pug appliques with her sewing machine. Then the pug onesies were complete! Kim said that the onesies made her cry. Gift giving success. My mom helped me out with the burp cloths too. I told her that if she wanted to stay at our house for Memorial Day weekend she would have to earn her keep by helping me sew. We did something very similar to this tutorial for the burp cloths. We cut the material (purchased at JoAnn Fabric) to fit the middle part of a cloth diaper (19″ x 6″). I use these cloth diapers. Then we folded the fabric over along the edges and ironed down the flaps. We used pins to secure the fabric to the middle of the diapers before stitching along the edges of the fabric to secure the fabric to the diapers. Want to know where I purchase the cute fabric for the burp cloths? 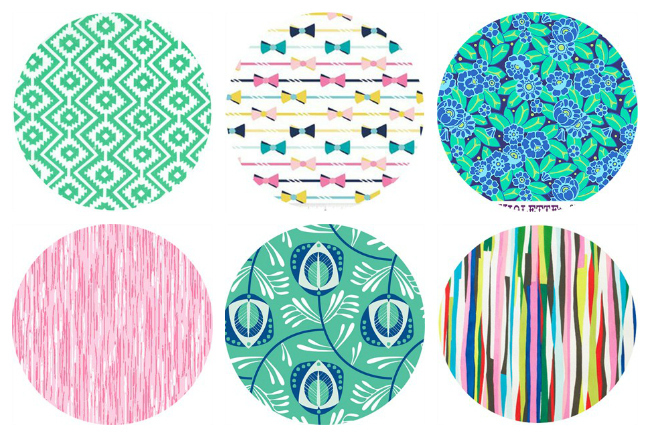 Check out this post on where to buy modern fabric! What’s your favorite baby gift to give or make? Awww they turned out SO cute! I love everything! You (and your mom) are so talented! What a special gift. Love the pugs!! 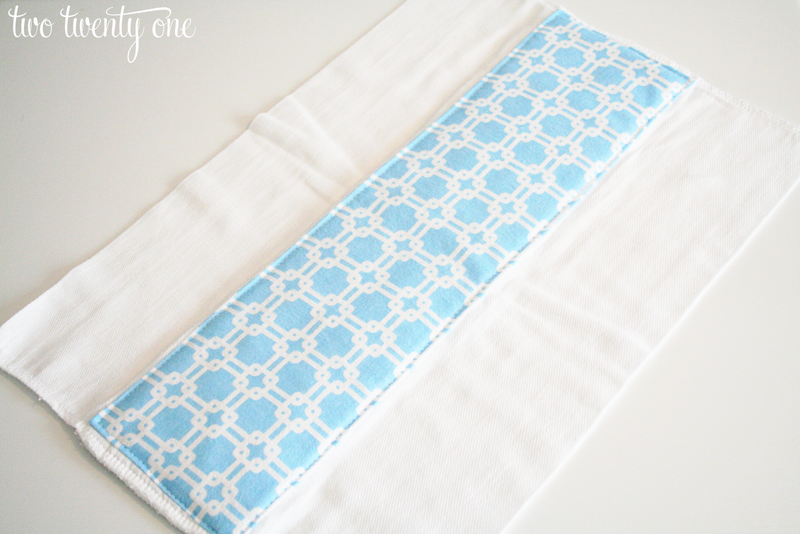 I need to venture into burp cloth making. They sound easy and look super cute! Love those! How sweet! One of my favorite baby gifts to make are wee knitted hats out of lovely cashmere yarn. I have made tons of them over the years and I enjoy giving them as much as receiving them. Would you ever consider a swap barter? Come see my site! I also love to give artwork! Oh my gosh, your mom’s zig-zag sewing machine skills are AMAZING – seriously!! LOVE the onesies!!! Cute! You and your Momma are some seriously talented ladies! Love this! Home made gifts are the best, especially when they look like this! These might be the coolest onesies I’ve ever seen! No wonder you made her tear up!! You are such a sweetheart! We love our gifts and they truly made our day. The pug onesies are fabulous! Too perfect for our family! The burp cloths – let’s just say that they are going to good use! Henry loves them! They are much prettier than any of the plain ones. Thanks again! You made us feel very special. I just made a diaper cake for my cousin, which I plan to do a post on next week. 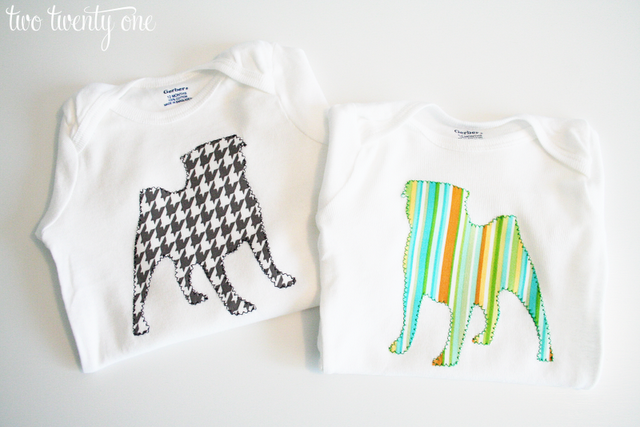 I love the doggie onesies! So cute!! 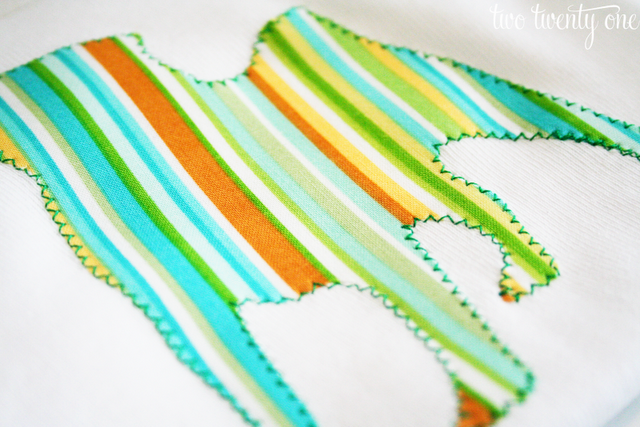 I just made my first applique…a deer head on a tea towel. That sounds really lame seeing it in print like this. Anyway, wish I’d thought to force my mom to do it…would have turned out much better, I’m sure! Mine looks like a drunk sewed it. Or was I?!?! Sorry about that! I updated the link. I absolutely love the burp clothes. Super cute! I think it would be fun to add these to an Etsy account (not quite together yet, but would like to make one soon)! Anyway, I was wondering what kind of fabric you used for the middle part? Thank you. I used flannel for the middle part. Did you wash and dry the cloth diapers before sewing the fabric on? I attempted to do this once and my result was so lumpy and bumpy looking since the diapers didn’t totally hold their shape after being washed. Yours look so neat and perfect.. Wondering what I could do different next time. Yeah, I wash and dry the fabric and diapers before sewing them. But I also iron the diapers and fabric before sewing them together. Ironing the diapers usually works all the lumps out. I love these! I have a question. Do you have a good place to find inexpensive onesies and cloth diapers? Ive been shopping around but their so expensive. You did a great job! I got the onesies and cloth diapers for this project at Target. Both are Gerber brand. The cloth diapers are about $17 for 10 premium cloth diapers which isn’t too bad in my opinion because they hold up well. Those are adorable!! Great job! Hello! 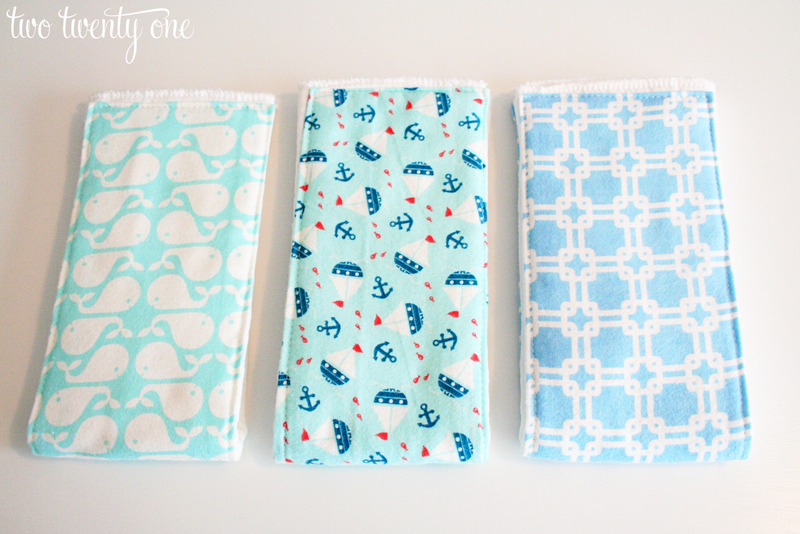 I am looking at making my own burp cloths exactly like you pictured here (love them!). I am curious what kind of cute fabric you used (cotton prints? flannel?) Also, is it better to have the cute cloth only on 1 side so it still has optimal absorption? Do you think it is better to have a stripe down the middle, or instead 2 stripes on the sides and leave the middle open/white ? Thank you for any insight/advice !!! I used both, but cotton holds up better than flannel. It’s totally up to you. I don’t think it really matters. I only do one side down the middle to get the most out of the fabric. Personally, I think they look best with a strip down the middle on one side like how I made them. If you want to do it on both sides you can but if my baby were to spit up on one side I wouldn’t flip it over and put the other fabric side facing out because then the spit up side is touching my shoulder. Does that make sense? Where is the pattern to print? Thank you. I bought 20 clothes and different patterns, so excited. How do you think 20 clothes is enough or I need more. I am confused what I need how much, going crazy!!! Did a burp cloth from another pattern but I’m going to make more from this pattern, it’s easier and neater in appearance. Glad to see a current blogger. Can u recommend a website where I can purchase cloth diapers for this project! oh thank you. Sorry i guessed i missed the link! 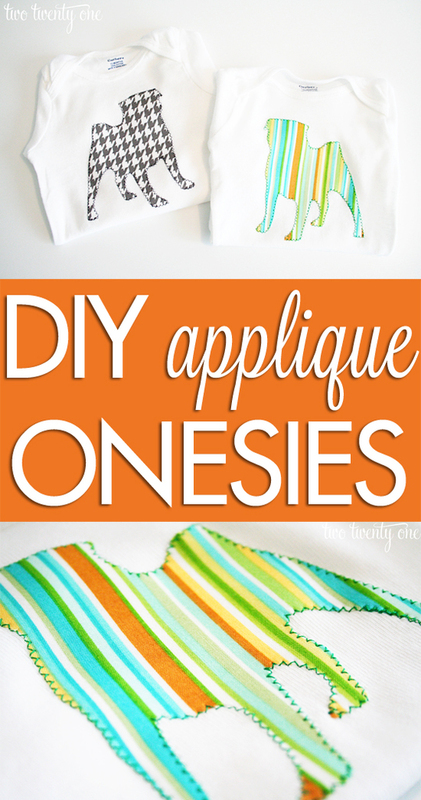 Did you wash and dry the diapers and fabric before making these? I want to make these and have seen other people have done this before starting. What do you recommend? I wash the diapers but not the fabric. Great instructions!! They were thee best! !